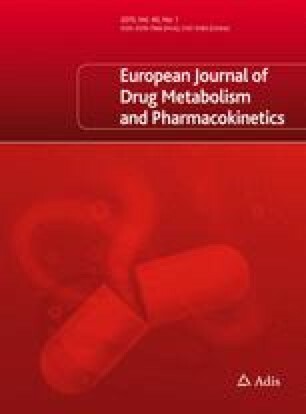 The single dose pharmacokinetics of flutoprazepam and its active N-desalkyl metabolite were determined in 8 normal subjects by using newly developed, highly sensitive, GC-MS and HPLC techniques. Following a 2 mg dose of the drug, the concentrations of unchanged flutoprazepam in serum were extremely low (below 5 ng/ml at 2 h) and declined rapidly to undetectable levels within 6–9 h after dosing. At all sampling times, the serum concentration of the N-dealkylated metabolite (N-desalkylflurazepam) was much greater than that of the parent compound. This metabolite appeared in serum rapidly (within 2 h), reached a peak between 2 and 12 h and declined slowly, with an elimination half-life of about 90 h on average. The serum concentration of two additional putative metabolites (3-hydroxy-flutoprazepam and N-desalkyl-3-hydroxy-flutoprazepam) was below the limit of detection (2 ng/ml) in all samples. Mild CNS effects (documented by prolonged choice reaction time) were present at 2 and 4 h but were no longer detectable at 9 h. It is suggested that unchanged flutoprazepam is unlikely to contribute significantly to clinical effects and that the drug exerts its therapeutic activity through conversion to the slowly eliminated N-desalkyl metabolite.